The following is a review of Nueve de Julio, a ships kindly provided to me by Wargaming. 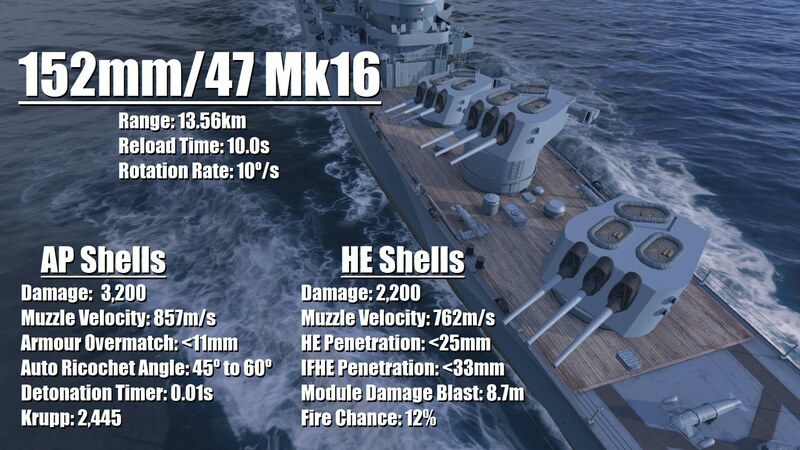 This is the release versions of the vessel and her stats are current as of July 11th, 2018. Shut down all garbage mashers on the detention level. Quick Summary: Effectively a Helena that trades a slower reload time, less engine speed and worse AA for an excellent heal. Cost: The equivalent of 8,500 doubloons. Patch & Date Written: 0.7.6.0, July 11th through 17th, 2018. 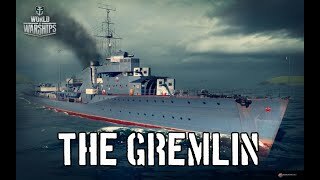 Equipped with a modified British Cruiser Repair Party that heals up to 40% of her hit points per charge. Capable of delivering massive alpha strike volleys with her fifteen 152mm guns. Shell ballistics allow her to make good use of island cover. Decent anti-aircraft firepower, including receiving a bonus charge of her Defensive AA Fire consumable. Citadel is exposed over the waterline beneath her funnels. Horrible 10 second reload on her main battery. Terribly short-ranged at 13.6km and long shell flight times. Slow 30.0 knot top speed with a bad rate of turn. First ship of the new Pan American line with no tech-tree prospects in the immediate future, limiting her use as a trainer. Wargaming told me that Boise is a clone of Nueve de Julio, however I was not provided access to the ship in order to review her. 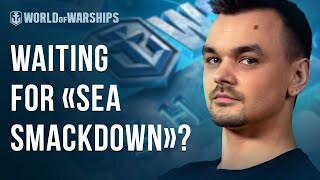 I could go on faith and parrot back the information that Wargaming gave me but I do not trust said information to be accurate. I spend a lot of time double checking the facts and figures Wargaming has advertised to ensure that the contents match what’s on the tin. Recent discrepencies between “finalized” versions of ship that I have been given to review and the release version are keeping me wary — Salem & Haida being the most recent examples. If I were simply to take Wargaming at their word and repeat back what they’ve told me without question then I’m no better than a mouthpiece for them. I pride myself on trying to deliver accurate details about upcoming releases so that you can make informed decisions on when and how to spend your money. I’m not spreading potential misinformation to my readers. Let’s hope the information regarding Boise is accurate. I don’t like what it bodes if it’s not. And so I apologize for the lack of up-to-date information regarding Boise at the time this article is published. If she ends up being significantly different from Nueve de Julio, I will publish a separate review of her. Until then, protect your wallets until you can get information from sources you trust. Nueve de Julio isn’t a comfortable ship to play. Like Duca degli Abruzzi before her, the presence of her Repair Party consumable makes her a little more forgiving of mistakes. However, she has a habit of exploding suddenly (and messily) if you’re caught out, diminishing its value. Her short-ranged guns are especially unforgiving. There are few ships I have ever played that feels as horribly outclassed when bottom tier as Nueve de Julio. 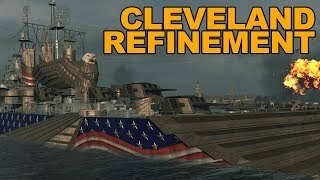 Veterans will be reminded of a stock tier VI Cleveland but with worse handling. Proper use of island cover is a must and this requires good map knowledge and situational awareness. In addition, knowing how to kite and abuse line of sight mechanics at the extremes of her range will help too. Her Repair Party is a welcome lifeline, allowing for attempts at bold plays that would be too risky otherwise. 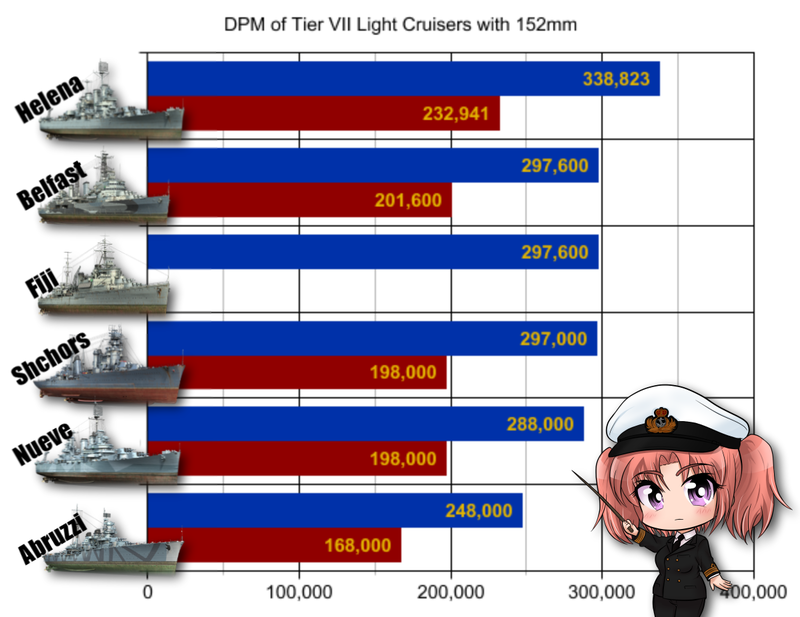 While she’s still-cruiser squishy, so is everything else at tier VII. She’s arguably the protected cruiser at her tier. Nueve de Julio is slow and, what’s more, she has a slow rate of turn She deserves her rating and then some. In all other aspects, Nueve de Julio only warrants a rating. Her anti-aircraft firepower is decent but not enough to compete with Flint, Atlanta and Helena. Her concealment is okay but she’s no British cruiser. Finally, her firepower is too short ranged and too slow firing to ever compete for anything better than at tier VII. Nueve de Julio has two non-standard elements to her options. The first is relatively minor. 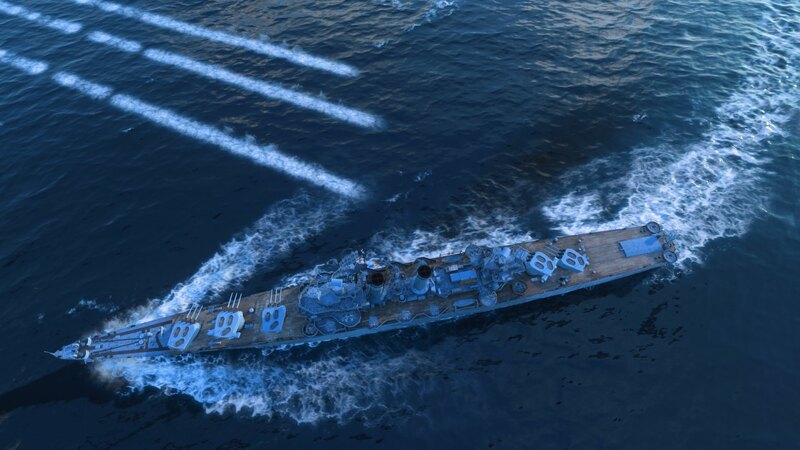 Like American cruisers, she gains an extra charge of her Defensive AA Fire, with three charges initially, upgrading to four with the premium version of the consumable. More importantly, she has access to a modified British cruiser Repair Party. 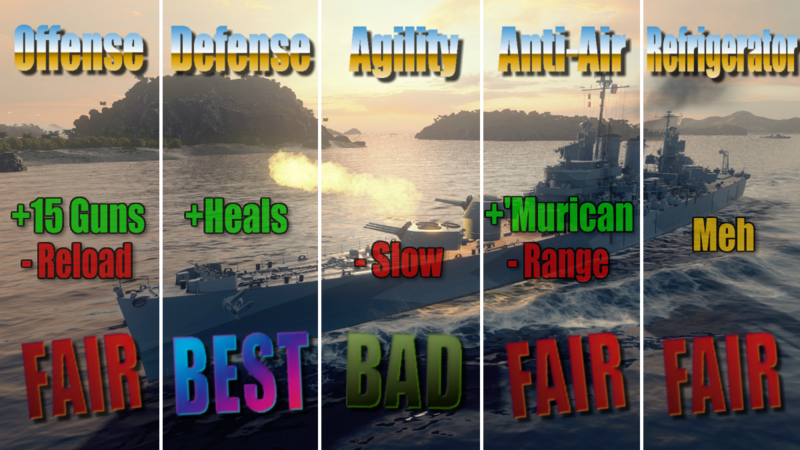 This heals up to 40% of the ship’s hit points per charge over 20 seconds. She queues up to 33% of citadel damage and 50% of penetration damage. Not much to say here. You have the choice between Hydroacoustic Search and Defensive AA Fire in her second slot. Remember to equip as many premium versions of the consumables as you can afford, with special emphasis on her Repair Party before all others. Nueve de Julio’s upgrades should look familiar for a mid-tier American light cruiser. There are a couple of choices to be made. If you intend to use Hydroacoustic Search instead of Defensive AA Fire then consider taking the special upgrade, Hydroacoustic Search Modification 1 in your second slot. Otherwise, default to Steering Gears Modification 1. While kiting, Nueve de Julio’s rudder gets shot out often. If you’re going to take the commander skill, Last Stand, then take Damage Control Modification 1. 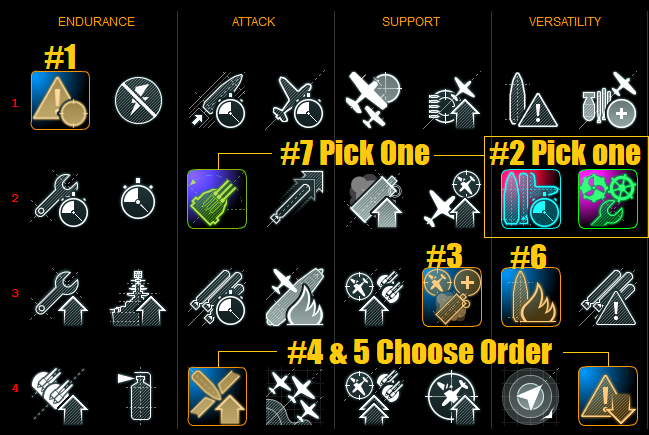 In your second slot, AA Guns Modification 2 is probably your best choice, regardless of your AA status and consumables. Nueve de Julio doesn’t engage at distances where the dispersion bonus provided by Aiming Systems Modification 1 are really necessary. Finally, in your fourth slot, Steering Gears Modification 2 should be your go-to. However, if you like parking stationary behind islands, then you may find use out of Propulsion System Modification 2 in order to assist adjusting your position more quickly when spotted. You have the option of running two different flags for Nueve de Julio — the Argentinian Naval Ensign or the Pan-American flag. This can be selected with the “Exterior” tab in port under the “flag” subheading. Main Battery: Fifteen 152mm/47 rifles in 5×3 turrets in an A-B-C-X-Y layout. A-B and X-Y are superfiring to the fore and rear respectively. C turret is mounted at the same elevation as A but is rear-facing with limited forward arcs. Secondary Battery: Eight 127mm/25 rifles mounted amidships between the bridge and funnels. Firepower wise, Nueve de Julio is to Helena as Prinz Eugen is to Admiral Hipper. In order to pay for access to her Repair Party, she sacrifices gun performance. In Nueve de Julio’s case, this comes two-fold with reduced range and rate of fire compared to her tech-tree counterpart. Let’s get the worst out of the way: Nueve de Julio’s range has as much appeal as duck puke. Her 13.56km reach is laughable and it should bring pause to anyone thinking of picking up this vessel. She has comparable engagement distances to Atlanta or Flint. This is a ship that must position herself upon the front lines in order to stack damage. At these ranges, there is little to no opportunity to dodge return fire from battleships. If you’re caught out, you’re in for a short-trip back to port — there’s no helping it. I remind you that this is a ship that will see tier IX matches on maps 48km across. Her short range feels all the worse with her slow top speed. Nueve de Julio struggles to project influence. There are a couple of rays of sunshine, though. The first is more of a sour-grapes statement: 152mm American shell ballistics makes landing hits in excess of 15km nigh impossible for anything but the most oblivious of targets. So, even if Nueve de Julio had the additional range, there’s not much she could realistically do with it. The other facet is more surprising: Nueve de Julio can engage in open water stealth firing. I know! What is this, 2016!? By engaging enemies at the very limits of her range and steaming away from them, Nueve de Julio can fire volleys onto the decks of approaching enemies without being detected. While other ships can also attempt this, Nueve de Julio’s short range makes for a smaller detection-bloom when she fires, facilitating this endeavor. So long as there are no enemies within this range, she will remain unlit. 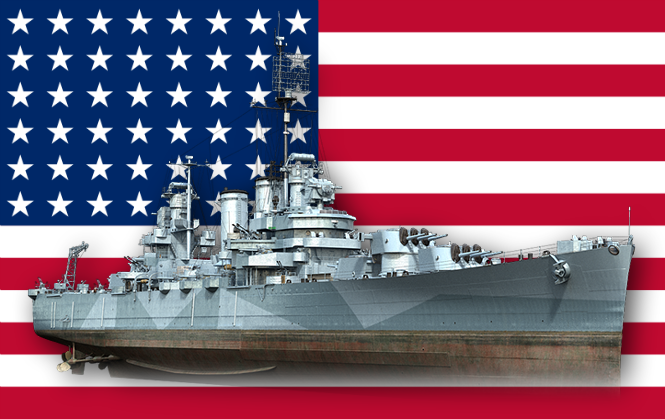 For an American-style cruiser, it was surprising for me to discover that she felt as comfortable in open water engaging opponents at maximum distance as she did hugging islands. Generally speaking, you’re going to want to hug islands, though. Hugging islands will keep you alive. Nueve de Julio’s high ballistic arcs simplifies using cover while still being able to deal damage. In addition, islands allow her to get close to destroyers and unwary cruisers to setup ambushes. Without access to Surveillance Radar, this is really the limit of her ability to successfully engage smaller, faster ships. This ship rewards map knowledge, so get to know your island waifus. It will help mitigate the drawbacks of her short reach and low shell velocity. AP shells in blue (top) and HE shells in red (bottom). Nueve de Julio has comparable sustained damage output to a twelve-gun light-cruiser. Her real strength is in the alpha-strike from her initial volleys. Nueve de Julio preserves Helena’s phenomenal alpha strike ability. On a per-volley basis, she delivers comparable damage to the ten 203mm-gun broadside of a Japanese heavy cruiser. Her specialty is landing these high damage strikes and forcing opponents to reassess the risks they’re taking. Delivering these volleys accurately is the key to Nueve de Julio’s success. She is fully capable of crippling destroyers with a single broadside or landing Devastating Strikes upon exposed cruisers with multiple citadel hits. Unlike most other light cruisers, Nueve de Julio is less forgiving of player mistakes in regards to aim and target selection. Her reload is punitive for a light cruiser at ten seconds per volley. Veterans of Mogami 155mm should be familiar with this rate of fire — Nueve de Julio matches it. However, she doesn’t boast Mogami’s increased shell damage or improved ballistics. In order to overwhelm opponents, she must choose her targets carefully and she must land multiple hits per salvo. Missed shots are frustrating to say the least as there are long waits between volleys making for missed opportunities. This lower rate of fire also dampens her ability to set fires. 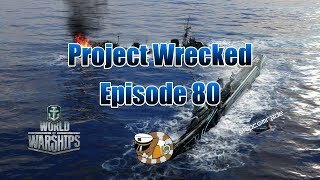 She’s worse at it than any of the other 152mm armed tier VII light cruisers save Abruzzi. A Furutaka makes the mistake of giving up her broadside within 11km of Nueve de Julio and takes five citadel hits for her troubles. To get the most out of Nueve de Julio’s guns, she’s reliant upon the commander skill Inertial Fuse for HE Shells (IFHE). This should come as no surprise to veterans. 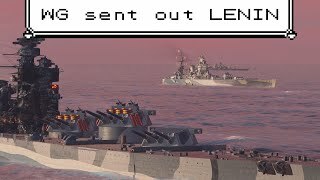 IFHE unlocks the ability for 152mm armed light cruisers to directly damage any battleship or cruiser they encounter with their high explosive (HE) shells. Without it, Nueve de Julio is incapable of damaging anything but superstructures of tier VI+ battleships and most tier VIII+ cruisers. No other skill option in the game spikes her damage output as dramatically and it should be considered a must-have for any build. Light cruisers are reliant upon their HE shells. This isn’t to say she should eschew the use of armour piercing (AP) shells entirely. With 150mm of penetration up to 10km, Nueve de Julio is capable of landing citadel hits against exposed enemy cruisers inside of this range. With up to fifteen shells landing at a time she’s quite capable of one-shotting many of the cruisers she faces. One of Nueve de Julio’s more troubling vulnerabilities are her fire arcs. Exposing her X and Y turret to enemies on her forward quarter opens up her to taking AP citadel hits in return. She has better fire angles rearward so long as you keep C-turret masked. Highly dependent on Inertial Fuse for HE Shells to make them competitive. Once that skill is in place, they become universal guns with great alpha strike and competitive DPM. Typical American light-cruiser guns otherwise — very floaty, very short ranged. Hug islands and kite your way to success. What it would have needed to be : Nueve de Julio is a long ways off here and is only spared a rating thanks to Duca degli Abruzzi being such a turd. There’s only one surprise here, so let’s start off with it — the rest is a mere afterthought anyway. Nueve de Julio has access to a high-tier British cruiser Repair Party consumable. 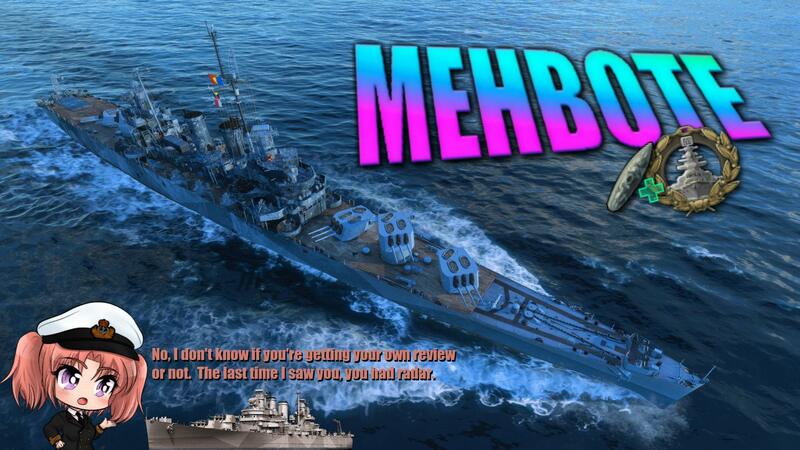 Effectively a dry-dock in a can, it allows you tank more damage than you have any right to endure. Combined with the Superintendent skill, the India Delta repair signal and a premium version of the consumable, Nueve de Julio potentially has a maximum hit point total of 97,236hp. It will be the super rare game that it ever takes more than 80,000 hit points to sink you, but you can safely assume that it will almost always take 50% more damage to sink Nueve de Julio than her hit points would otherwise indicate. This is of course barring receiving Devastating Strikes. For all of the merits of her Repair Party, Nueve de Julio is still a cruiser. She’s very vulnerable to citadel hits, especially if you over-angle to bring her X & Y turrets onto a target. Battleships will be all too happy to blow out your machine spaces if you leave her exposed. She’s similarly vulnerable to torpedoes with no damage mitigation there. Despite this weakness, Nueve de Julio’s citadel is mostly submerged — something Abruzzi and Fiji cannot boast with their own abilities to heal. It’s only beneath Nueve de Julio’s funnels where her citadel peeks up over the water’s surface. Overall, this one tough cruiser. She’s still a cruiser, mind you, and not a battleship. Still, Nueve de Julio makes a mockery out of Fiji’s and Abruzzi’s ability to heal, which really says something. What would have to happen to DOWNGRADE to : It’s only a contest here between Fiji and Nueve de Julio. Our new girl wins out grace of better belt protection, a better heal and a less-exposed citadel. Nueve de Julio cannot maintain even 24 knots in a turn. This affects her rotation rate and makes her feel very sluggish. This gets pretty harrowing when there’s fish on the way or you need to dodge incoming shell fire and it taxes her Repair Party as a result. Imagine taking Shchors and blowing off both of her kneecaps and then demanding she run a marathon. You’ve now got a pretty good idea of how Nueve de Julio handles. This cruiser is painfully slow and she lacks flexibility because of it. It’s downright shocking how noticeable her lack of speed is — especially when you’re trying to scramble to cover. You can forget any pretense of dictating engagement ranges. It just doesn’t happen in this ship against anything but the slowest of brick-battleships. What it would have needed to be : At least two and a half knots more speed. Nueve de Julio’s anti-aircraft firepower is frustrating. It sits upon the cusp of greatness. For raw damage-per-second (DPS) values, she’s in a good place. She can spit out a wall of flak that’s more than sufficient to make aircraft want to avoid the airspace she’s protecting. The only downside is that the size of this airspace isn’t very large. Like many low-tier cruisers, her large caliber guns do not have a commanding range. This largely limits her flak to self-defense unless a player elects to invest heavily into upgrades to improve it. Between the commander skill, Advanced Fire Training and the upgrade, AA Guns Modification 2, Nueve de Julio’s large caliber AA bubble can be extended from 4.2km up to just over 6.0km. While this is much more respectable, it’s a very expensive investment for situational gains. It’s still not enough to let Nueve de Julio ambush aircraft with a full stealth build — her aerial detection range exceeds this upgraded reach by 650m. Given the expense of skills needed to upgrade her main battery firepower performance with Inertial Fuse for HE Shells this can be a cost she simply cannot pay. As it stands, Nueve de Julio’s AA defense is good enough for her own personal use but not much more beyond that. What it would have needed to be : Nueve de Julio is a long way off from being able to contest Atlanta and Flint for supremacy. Upgrading her 127mm/25s to 127mm/38s to get that 5.0km base range would be a good start. Nueve de Julio’s concealment is largely slaved to the range of her main battery. On paper, she has a decent surface detection range. “Good” cruiser stealth ratings usually weigh in with a sub-10km. Nueve de Julio exceeds that but only barely. Still, she’s not in a terrible place in this regard and she might even be deserving of a little praise. However, the temperament of her guns sours Nueve de Julio’s concealment. Like the Atlanta-sisters in order to do damage to the Red team, Nueve de Julio must get close — dangerously close, even. She is painfully short ranged. If there are aircraft or destroyers present, she cannot count on being able to take up a firing position undetected. While she is thankfully capable of shrugging off minor damage thanks to her Repair Party, this still presents an element of risk, especially if she tries to engage enemy battleships. 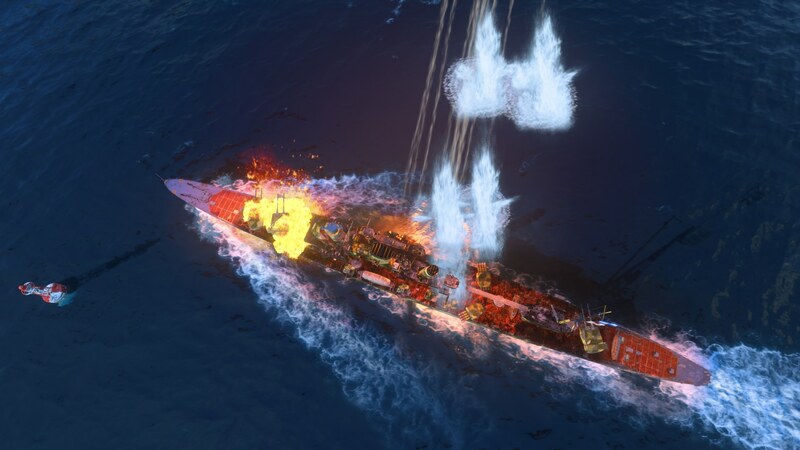 At 13km, you have between six and eight seconds worth of reaction time to dodge incoming battleship fire. Given Nueve de Julio’s sluggish handling, this just isn’t enough time to avoid shells effectively. Generally speaking, Nueve de Julio does best camping islands and using terrain to block line of sight while she engages enemies. You can attempt to be brave and kite at the extremes of her range in open water and enjoy some success, but be aware this works best against distracted or slow enemies. What it would have needed to be : It’s not going to happen. She’d need a Smoke Generator at the very least to begin to contest Fiji and Flint. At tier two, take either Last Stand or Adrenaline Rush. 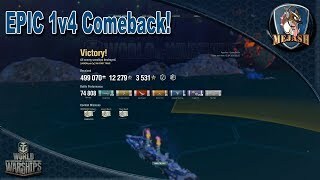 The former will help keep you alive from inevitable steering gears damage when kiting. The latter is a flat out DPM increase for your guns. We’ll come back to these skills later, so move on to tier 3 after picking one of the two. Next, take Superintendent. This gives you an extra charge of your Repair Party which is Nueve de Julio’s great strength. At tier 4, you’re going to double up. Take either Concealment Expert or Inertial Fuse for HE Shells and then save up your next four points to pick up whichever skill you didn’t grab the first time. Slip back down to tier 3 and take Demolition Expert for your sixth (17pt) skill. And finally, we’re back down to tier 2. If you have not taken Adrenaline Rush as your first skill here, take it now. Otherwise, you can look at taking something else, like Expert Marksman if Last Stand doesn’t appeal. There are alternative builds to consider, such as an anti-aircraft specialized build but Nueve de Julio’s real strength is as a tough artillery ship. This ship really surprised me. I originally dismissed her as Duca degli Abruzzi 2.0 — an under-performing ship propped up by a Repair Party consumable. However, unlike the Italian lemon, Nueve de Julio’s damage output isn’t horribly mutilated. She can put out the damage and at a respectable rate. Oh, she’s not going to be the darling of DPM like Helena, but Wargaming seems to have found a happy balance between her damage output and her regenerative abilities. They’ve done this before between Prinz Eugen and Admiral Hipper. It’s nice to see them nail it quite convincingly here. Now, I say ‘balance’ but be warned — that doesn’t necessarily make her “fun” or “good”. This won’t be a ship I reach for to relax. If I’m going to play a tier VII light cruiser, I’m still reaching for Atlanta or (if I’m feeling mean) Belfast. I don’t find Nueve de Julio’s gunnery fun. I fight with her range more than I ever did in Atlanta which is really saying something. While she is tough, it didn’t wow me the way I would hope it did. She felt right. She feels balanced. But she doesn’t feel fun. I dunno, maybe it’s a bit of lull in my enthusiasm post-Haida. Nueve de Julio is a good, safe purchase for those that are aware of her shortcomings. She won’t replace Helena, but she will supplement that style of play for those who enjoy it. It’s worth repeating: This Review is about Nueve de Julio, not USS Boise. Until you see some recent (post end-of-July) game play of Boise, do not make any assumptions regarding her performance. Very yes. Nueve de Julio can spit out the damage, she can be setup to handle air-attack and she’s got that Repair Party to give her the longevity to tank out missions in scenarios. She’s a great choice for PVE modes. Yes. Keep her short range and low top speed in mind. She does well in the chaos of Random Battles, at least until she’s facing tier IX ships. Few ships I’ve played feel so horribly handicapped when bottom tier as Nueve de Julio. No. 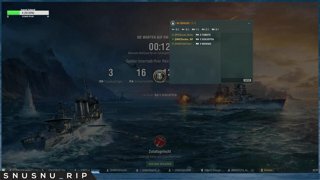 There are better cruisers for competitive modes. Nueve de Julio is a respectable ship, do not get me wrong, but Surveillance Radar is the consumable to have for competitive at tier VII. Very no on toast. Nueve de Julio’s history is downright horrific. No. This ship didn’t tick the right boxes for me. She’s decent, but I didn’t enjoy her overmuch. I was more than a little grumpy throughout writing of this review. No, it had nothing to do with the history of this ship. I’m not touching that hornet’s nest with a ten-foot pole. For me, it’s all about Boise. I don’t like the uncertainty surrounding this prequel-ship to Nueve de Julio. It also speaks poorly of my relationship with Wargaming that I don’t feel a measure of trust regarding this second release. I’ve been burned too frequently in the past to take them at their word on this. I hope my misgivings aren’t warranted. I hope, I hope. Reviews will continue to be a little slower going forward — the release schedule isn’t terribly hectic at the moment. USS Boise will be the next ship reviewed, provided I get access to her in a timely manner. If she does end up being a Nueve de Julio-clone, I will simply amend, re-title and re-publish this review to say as much. If she doesn’t, well, a full review will be coming.